Bosworth Flashcards Blues Licks German, Classic Blues Licks - 50 great licks for all guitarists, from Robert Johnson and Leadbelly to Hendrix, Clapton and beyond. 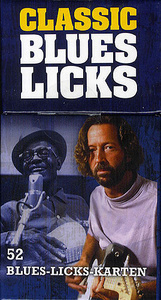 Full instructions in clear TAB, images and inside info for each lick, complete TAB guide, full colour photographs. German edition.